The ZymoPURE™ Plasmid Miniprep Kit features a spin column-based method for the purification of up to 100 µg of ultra-pure endotoxin-free plasmid DNA in less than 15 minutes. The unique spin-column design also provides zero buffer retention and a low elution volume. ZymoPURE™ technology uses a modified alkaline lysis method and features novel binding chemistry that yields highly concentrated plasmid DNA (up to 3 µg/µl). In addition, the wash regimen has been optimized to ensure the plasmid DNA is free of endotoxins, salt, protein, and RNA. The result is plasmid DNA suitable for transfection, restriction endonuclease digestion, bacterial transformation, PCR amplification, DNA sequencing, and other sensitive downstream applications. 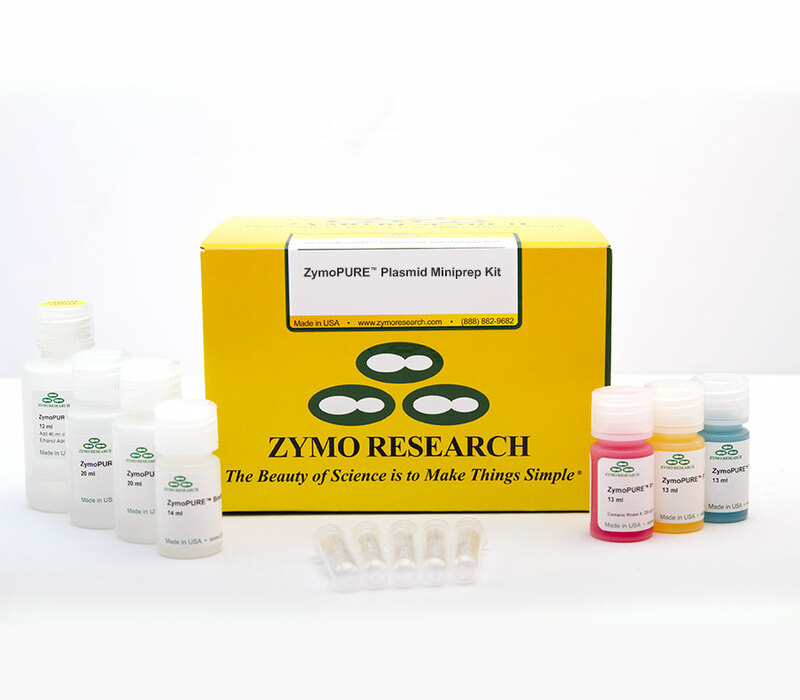 As an added convenience, the ZymoPURE™ Plasmid Miniprep Kit contains colored buffers that permit error-free visualization and identification of complete bacterial cell lysis and neutralization.